The Average Wedding Can Cost Up To $20,000 But You Can Learn How Have The Wedding That You Have Always Dreamed Of Without You Sacrificing Nearly All of Your Recourses! Theres going to be a wedding! What a wonderfully, joyous time! But along with those happy feelings, comes a whole other set of emotions. We certainly know how youre feeling. Its not all that uncommon. Youve got a mixture of utter elation, a little bit of fear, and some confusion to top it all off. The daunting task of planning a dream wedding looms ahead of you. Maybe youre reading this as the happy bride or groom. Perhaps you are the mother of the bride and need some tips on how to give your daughter the wedding shes always dreamed of. It doesnt matter who you are, what matters is that youve found us! Weve Got The Answers Youre Looking For! Now that the happy couple is engaged, theres so much to do for the wedding, you might feel overwhelmed. Thats understandable. You want a beautiful, memorable wedding, but the funds just arent where you think they need to be in order to have that type of ceremony. Its alright there are many people who are just like you. Thats Exactly Why You Need This Book! Its a special day and you want it to be everything youve ever dreamed about. It can be! No matter how small your budget is, there are ways to maximize your budget and make it go farther than you ever thought it could. The cost of a dream wedding can rise into the tens of thousands Of dollars very, very easily! My grandparents first home cost $15,000. It was a beautiful brick ranch home in an upper middle class neighborhood that they lived in for many, many years and raised two children in. It can be mind-boggling that some brides think its alright to spend that much money on an event that lasts just one day! But for many, its a cost theyre more than willing to incur. After all, most brides plan on their marriage lasting a lifetime, so the investment in a dream wedding is just a way for them to reassure not only themselves but those around them that they are that confident about this union. Thats OK! The reality is that there are not many people out there who are able to spend that kind of cash on a party. But they do want a wedding that is memorable, beautiful, and the one that theyve always dreamed of. Well, guess what? 3. A Huge Price Tag! A great way to start is by ordering our valuable book, Throw A Wedding on a Shoestring Budget today! This all-in-one comprehensive guide compiles tips from wedding planners, event coordinators, and brides who have been there and done that thrown a gorgeous wedding on a shoestring budget! You could search for tips like these on your own, but why do that when its all right here! Weve done the work for you! 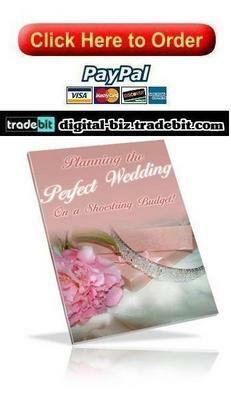 Along with page after page of money saving tips, this book also gives you valuable checklists to keep track of expenses and make sure you have covered all aspects of throwing a wedding. Theres nothing worse than being a week away from the wedding and stressing over whether or not youve covered all your bases! Well Help You Do That! What are you waiting for? Order Throw a Dream Wedding on a Shoestring Budget today for the low price of $1.99! You want to save money on your wedding, save money on wedding advice too, with this book. Need a little reassurance? Thats alright we can give that to you too! How about a little word from a bride who read our book? When Jim proposed to me, I was so happy! I wanted to be able to have a great wedding, but werent sure how we could do it with the budget we had come up with. Then I read this book! Our wedding was not only beautiful, but so much fun! Our family and friends still talk about it today and weve been married for 3 years now! Thank You So Much! Ive been planning parties and weddings for 6 years now. It used to be a lot of work to do research and find solution for my clients who didnt have a ton of money to plunk down on a lavish wedding. Now that I have this book, Ive got all the answers I need! I look to it often during the planning stage and have found some great ideas that I use all the time! You could hire a wedding planner to coordinate your wedding. But when you order this amazing book, you wont have to. Theyve Read our book and agree that its definitely worth the $1.99! We are offering you this amazing and valuable guide to having the wedding of your dreams in an exclusive offer. If youve always wanted a great wedding, its well worth it to order our ebook for just $1.99!